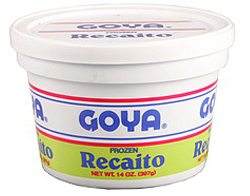 I’ve seen several Pinterest posts about the ‘hack’ of making dulce de leche from a can of condensed milk. I always kind of chuckle to myself, because my family has been doing that for generations! I have vivid memories of my mom boiling cans of condensed milk either in the pressure cooker, or just a regular pot on the stove top. Over the years, canned dulce de leche became more readily available & we haven’t had to boil leche condensada in a while. I made a dulce de leche Pumpkin Pie (along with dulce de leche whipped cream) for Thanksgiving, so naturally I needed some dulce de leche! I was kind of shocked that it was $3.50/can at my local grocery store. I needed 2 cans – $7! I mean, it’s not gonna break the bank, but since I no longer bring in the income I used to, I see it my job to save money where I can. And I noticed that condensed milk was only $1.29/can. So for less than the cost of ONE can of dulce de leche, I could make 2. I called my mom for guidance & she told me to Google it. Seriously, Mami?!? She did eventually give me some instructions, but she encouraged me to look it up anyway in case there was a better way. So I did, & saw this post for doing it in the crockpot. I’ve written before about how I’ve really come to love my crockpot. I’m constantly impressed at just how versatile it is. The impression I had of slow cookers growing up was that it was a gringo thing that made mushy food. 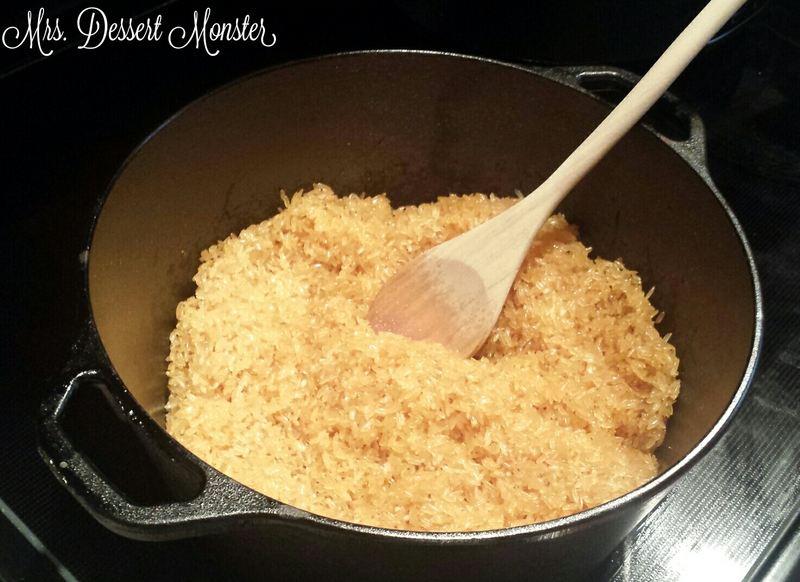 But here I was making dulce de leche! A lot of the non-crockpot recipes to make dulce de leche involve keeping a close eye on your cans so that the water level stays high enough to cover them. With crockpot, that’s way less of an issue. I checked on mine every couple hours & it was almost unchanged the whole time. After 8 hours, I turned off the crockpot & opened the lid to let it cool a bit before taking the cans out of the water. I then waited until the next morning to open the cans – partially to make sure they were cool, but mostly because I wasn’t going to make the pie until then. The dulce de leche was beautiful! This method of making it is perfect for me. I didn’t have to watch a boiling pot on my stove for hours while also wrangling a baby! If I see dulce de leche in stores for a good price, will I buy it? Probably. 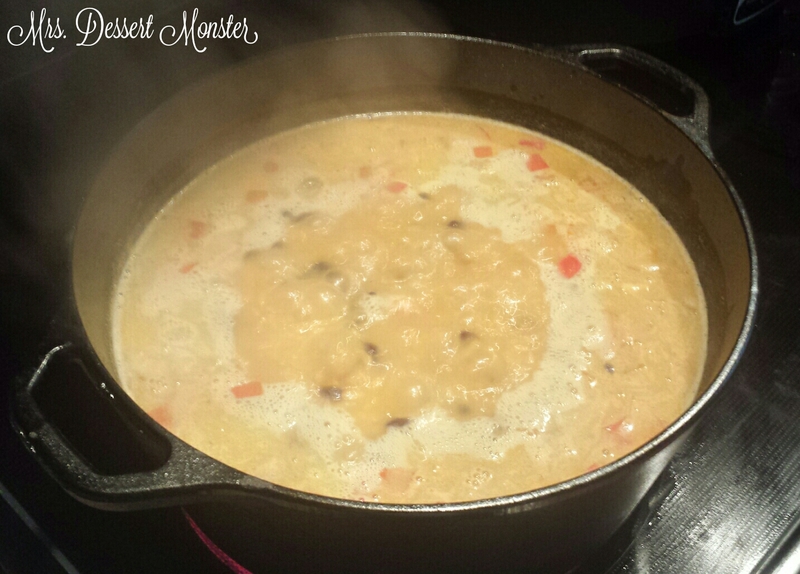 But when I have some time to spare & some condensed milk, I will turn to my trusty crockpot! Peel the labels off of the cans of sweetened condensed milk. Place the cans on their side inside the crockpot. Fill the crockpot with water, covering the cans by about an inch. Periodically check to make sure there is always water completely covering the cans. Add more if necessary. Cook the cans in the crockpot for 8 hours on the low setting. Once done, let the cans cool completely before opening. ***There is risk of explosion if you open a hot can! 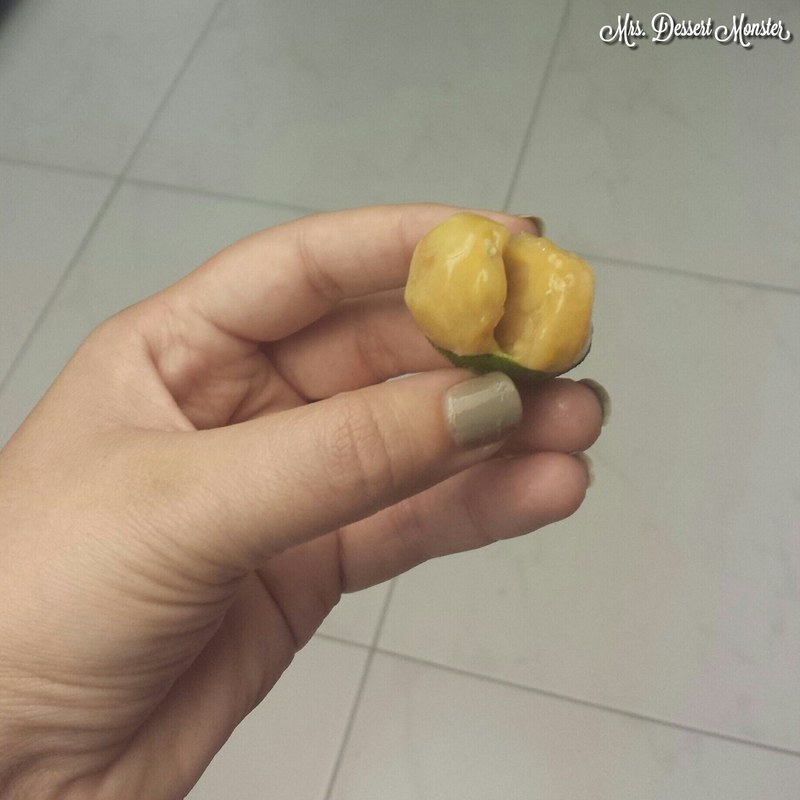 This fruit goes by many names: mamoncillo, mamon, guinep, quenepa, Spanish lime, etc. The name may change depending on where you are, but one thing that doesn’t change is how delicious it is. 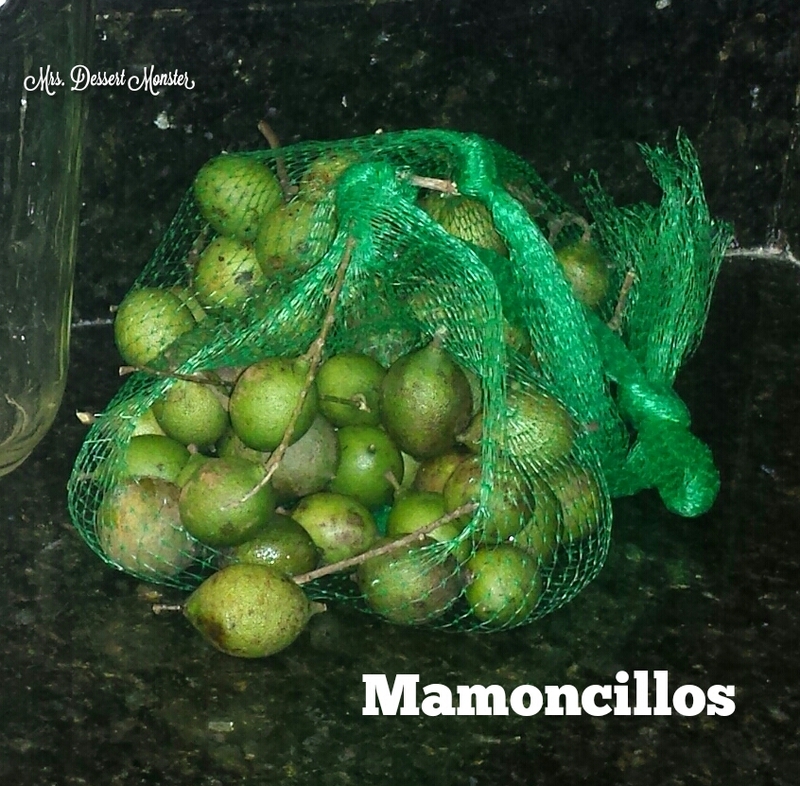 Mamoncillos are in the lychee family, but the taste does not compare. 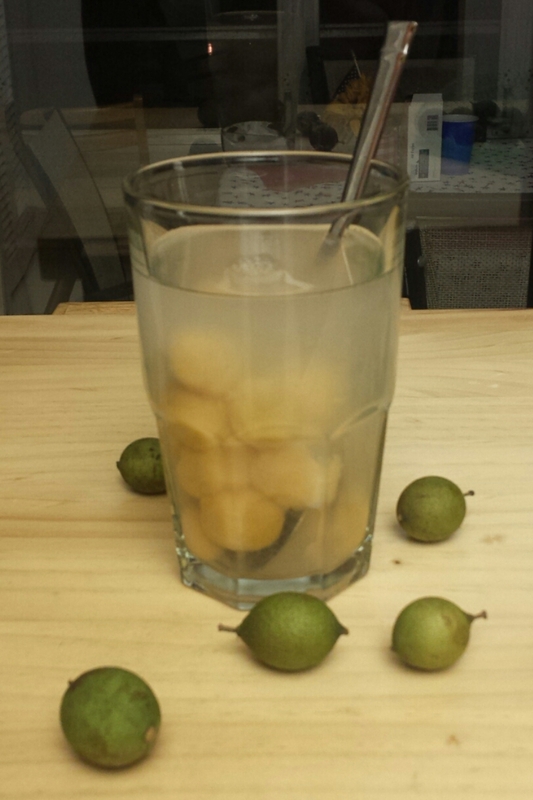 I do not like lychee. I love mamoncillos. If you have never heard of this fruit, that’s OK. I’ve grown up with it all my life. It’s one of the perks of being Cuban. This is the season for them, but I never see them around where I live. Fortunately my best friend, Frank, lives in Miami & brought me some recently. How do you eat this fruit? 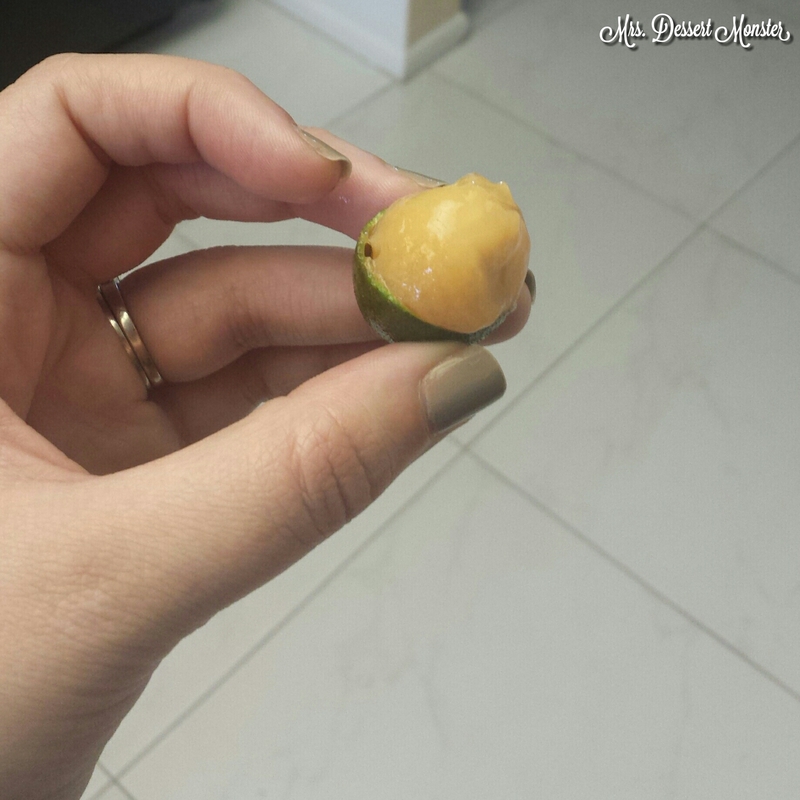 You crack the skin open with your nails or teeth & reveal the fruit inside. Then you pop it in your mouth & eat the pulpy fruit around the pit. This is what’s left when you’re all done. There’s not a lot of fruit to one mamoncillo. But you’d never eat just one! 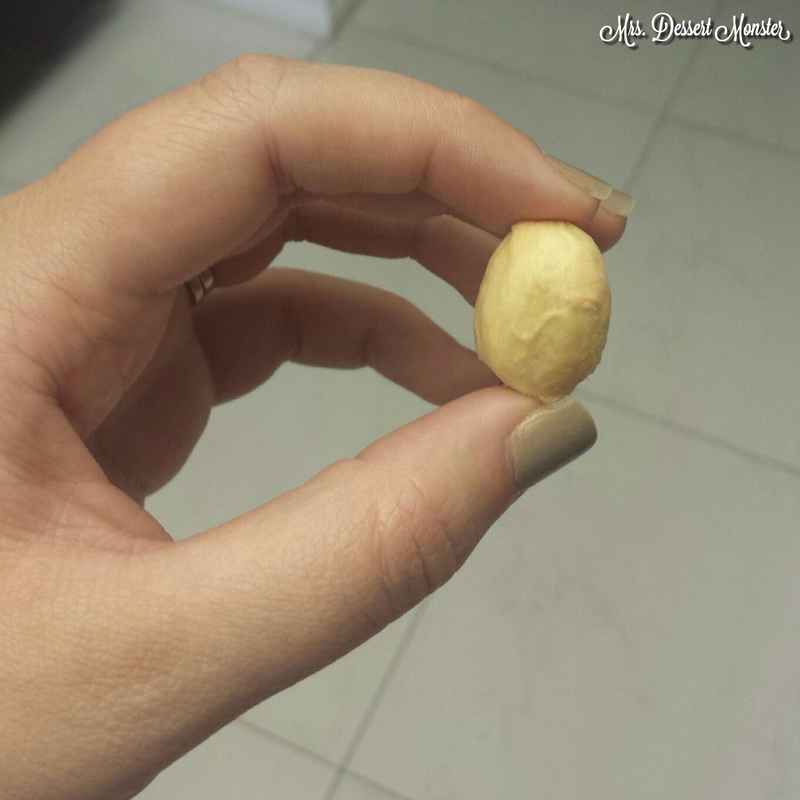 WARNING: these little guys will stain your clothes. Handle with care! I might have lost some of you guys right off the bat with the word ‘champola’ in the title. What is champola? The closest word I can think to describe it is ‘refreshment’. 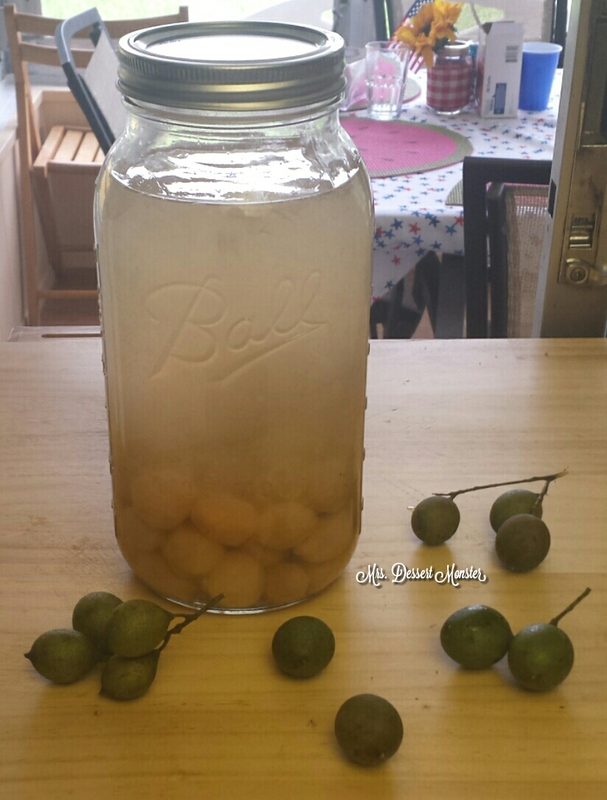 This champola, like most other recipes I’ve seen online, is really easy: water, sugar, & mamoncillos. I peeled like 1 & 1/2 bags of mamoncillos & put them in a large mason jar (the ones left over from my wedding centerpieces). I then filled the jar with water & about 1/2 cup of sugar. Then you just leave it in the fridge overnight before serving! Mmm! 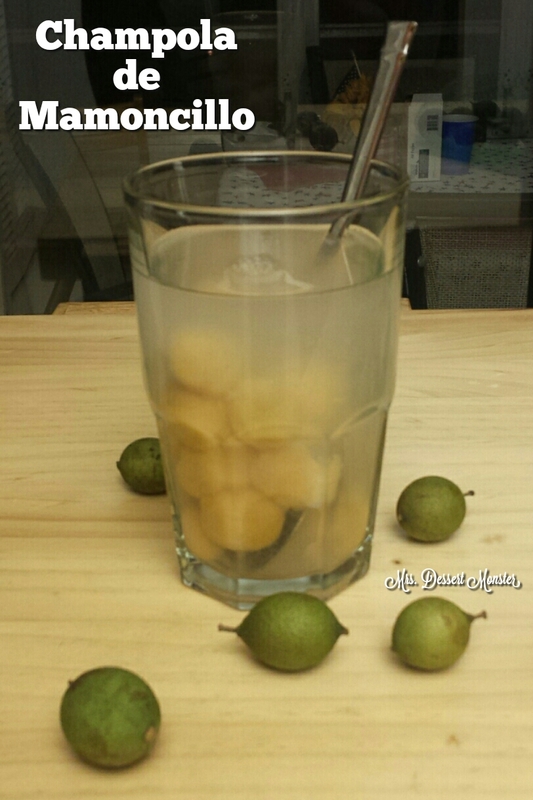 You get a delicious beverage AND get to eat the mamoncillos when you’re done! 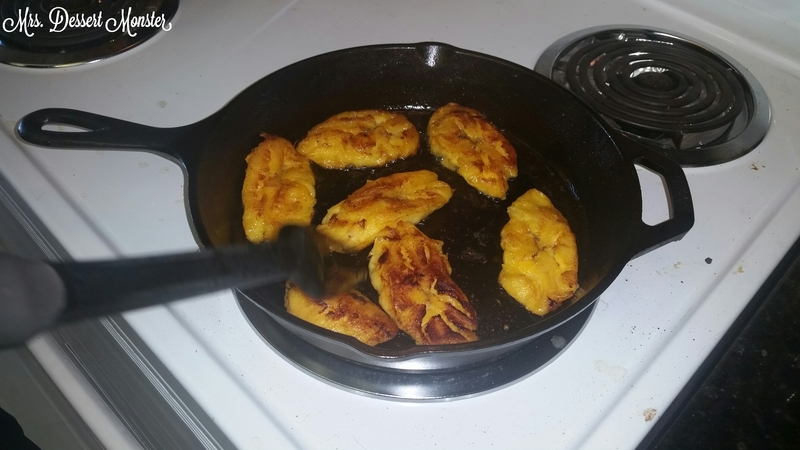 Since it had already started ripening when we got it, I knew what I wanted to make out of it: platano maduro frito (fried sweet plantain). We finally got the house in decent enough shape to have my parents over for a father’s day dinner celebration, & this dish was a perfect addition to our spread! Since Mami was coming over, I asked her to help me make these. 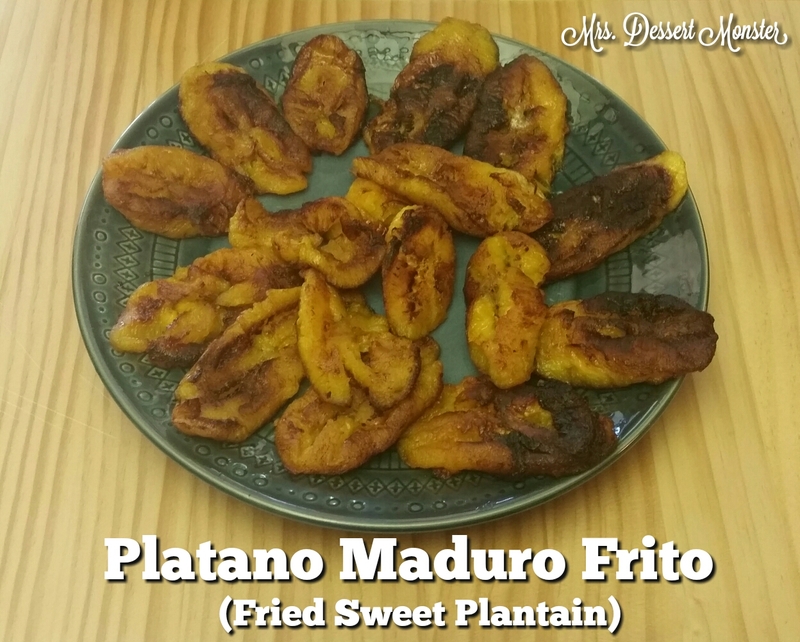 This recipe uses ripe plantains (maduros). 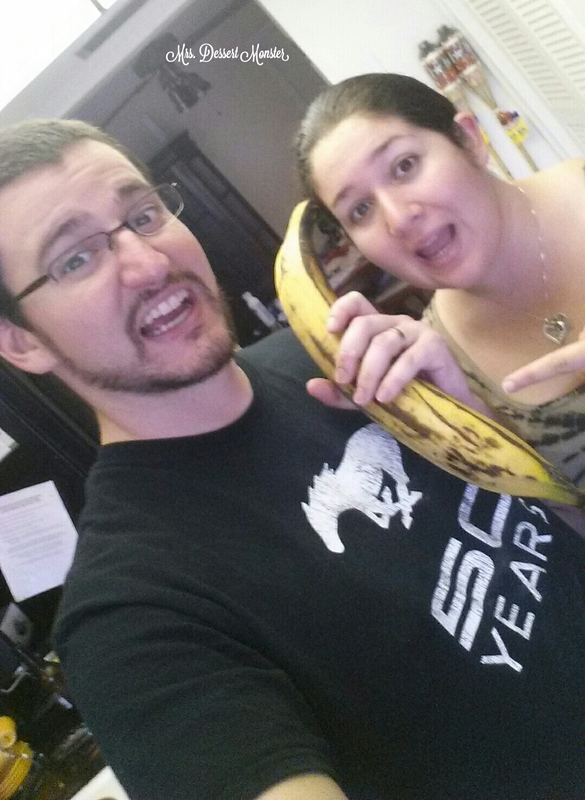 Like, super ripe. 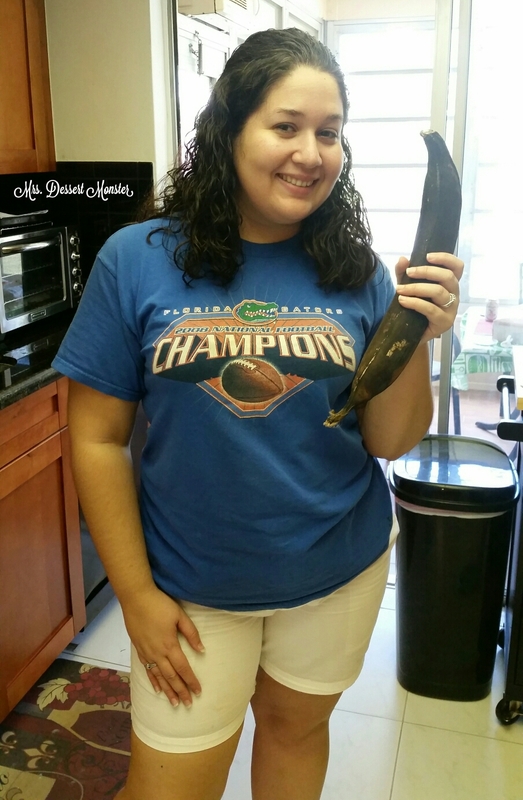 Like, the plantain in this picture looks really black, but my mom says I probably could have waited a few more days. The plantain should feel soft when you squeeze it gently. You peel the plantain & slice it up into long, diagonal slices. Then you put a little sugar on them. Pour enough vegetable oil to thinly coat the bottom of a frying pan (this isn’t deep frying!) 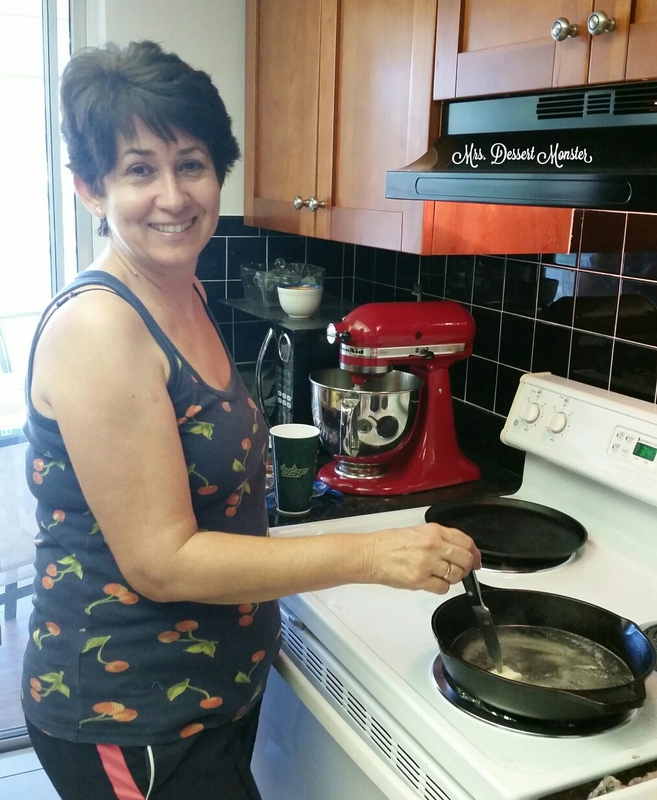 Tip from Mami: adding a tablespoon or two of butter to the oil gives it a great flavor! Fry the slices on med/high heat until they are brown on one side, then flip to brown the other. Once both sides are brown you are done! 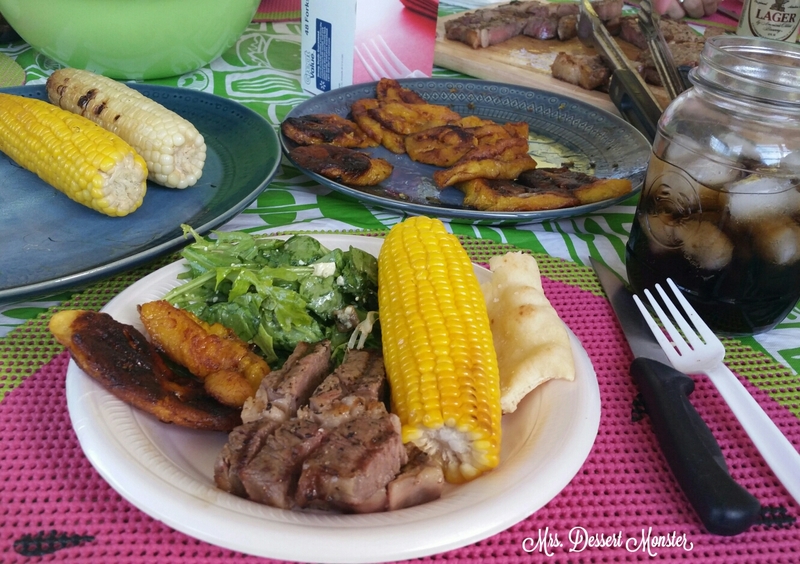 These plantains are a little delicate – do not put them on a paper towel or they will stick! I sprinkled a pinch of salt on them to bring out the sweetness even more. 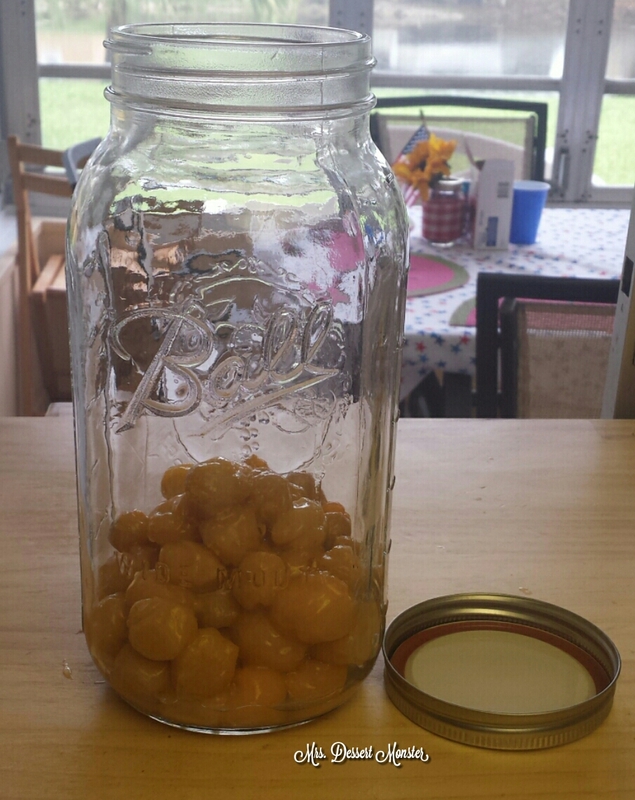 These were a wonderful, sweet addition to our feast! 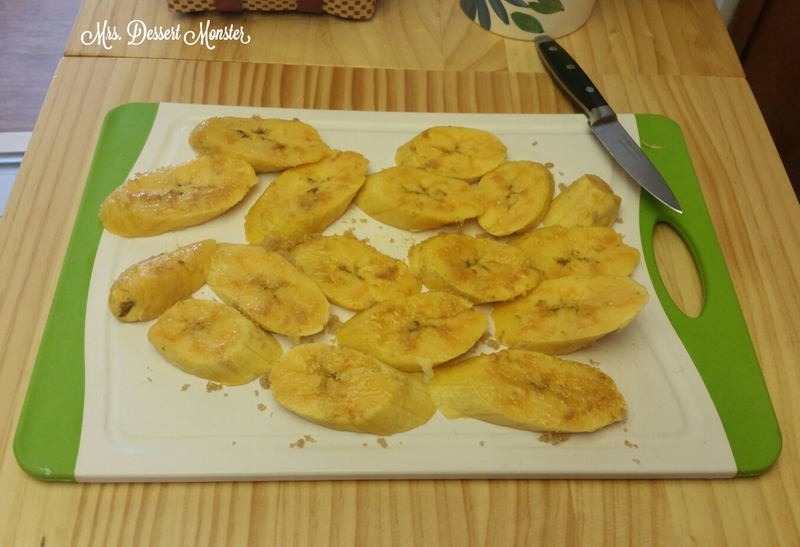 Peel the plantains & cut into long, diagonal slices. 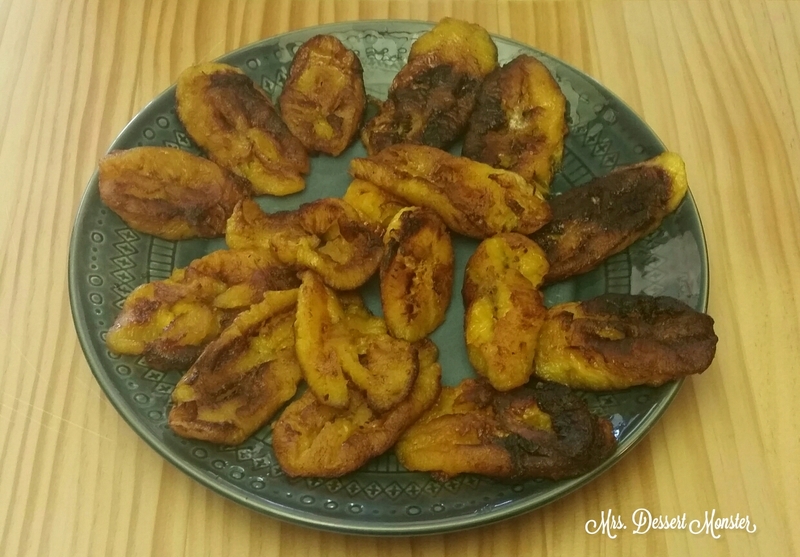 Sprinkle some sugar over the sliced plantains. Pour a thin layer of oil in a frying pan. Add 1-2 tablespoons of butter & let it melt. Fry the slices on med/high heat until they are brown on one side. Flip to brown the other. 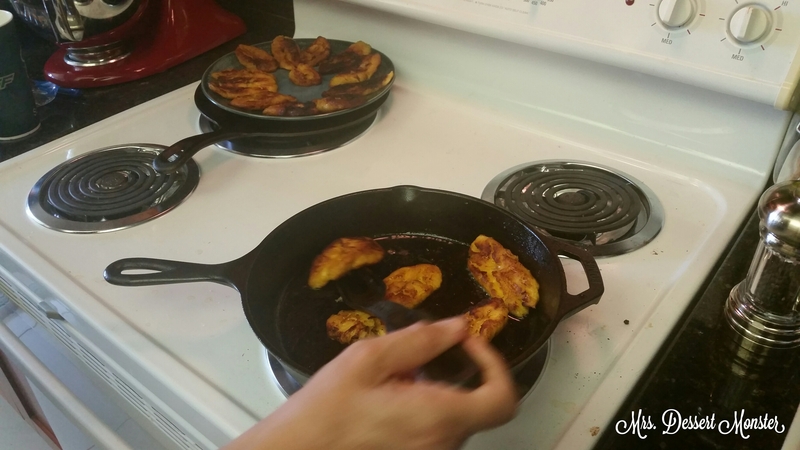 Once both sides are browned, sprinkle a pinch of salt over the plantains. I’m not a big rice person. Maybe it’s from having to eat it all the time when I was little. Cubans eat rice only second to Asians (One of my old college roommates was Chinese-American & did not consider it a proper meal unless she had some white rice. She also had like this 6th sense ability to know when the rice cooker was done. I love her.) 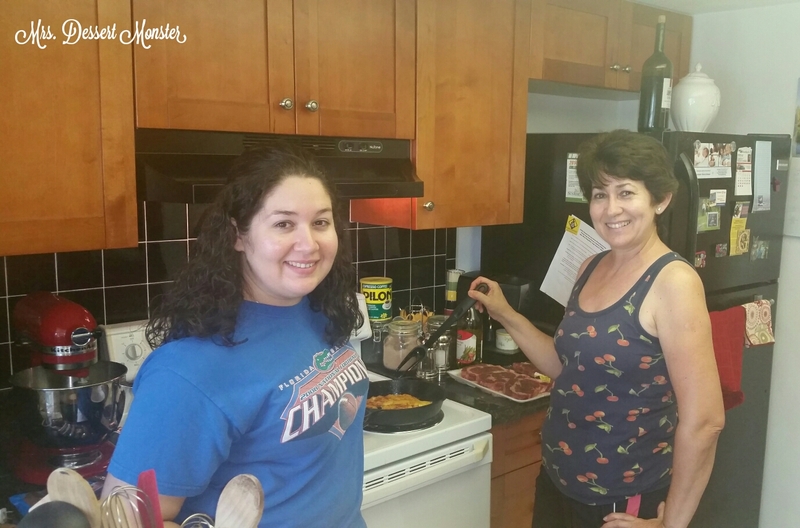 I like to make Cuban food when I’m cooking for people, and most of the time that includes rice. Especially in this case. My husband & I were going to visit some friends who had recently had a baby & bring them some lunch. We asked the new mom what she would prefer & she said rice would be great. So as you can see, I had to. Rice, rice, rice. I was actually excited to make this recipe. We call it Congri. If you call it Moros, we can’t be friends. Just kidding! If you have no idea what either of those words means, we can still be friends & you learned something new. My mom gave me this recipe, & I hadn’t made it in a long time. It was also the perfect excuse to break in our cast iron dutch over. The only thing is that I forget that when I took down the recipe from Mami, I was making it for a party. This recipe makes enough rice for like 15 people; 10 if they are big rice fans. Rice. I gathered & prepped all my ingredients (in my pretty bowls, just for you guys) & got to work. 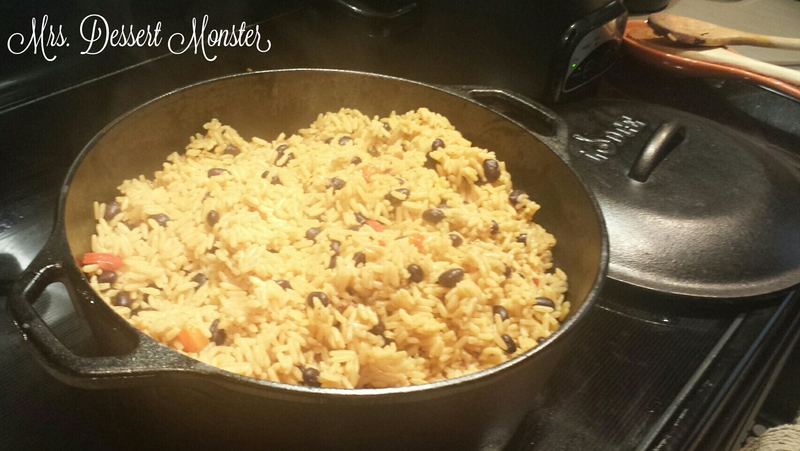 The first step is to sofreir -sauté- your rice with oil & Sazón. Mami says this step opens up the rice kernels & makes them taste better. If nothing else, this will help keep the rice from sticking & season it evenly. I did this for just a few minutes until the oil was making a hissssss sound. Next you add all the other ingredients. If you don’t know what Recaito is, it’s a mix of onions, roasted garlic, sweet peppers, green bell pepper, cubanelle pepper, cilantro, & culantro blended until smooth. 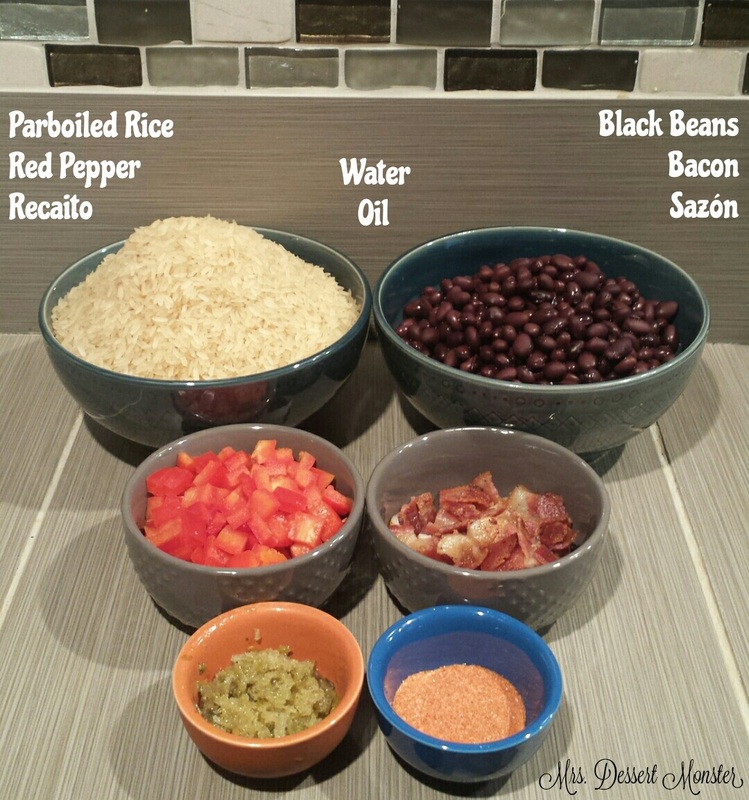 If you make your own beans for this recipe (the old fashioned way it’s supposed to be done), use the water you boil the beans in to make the rice – it gives it that traditional congri color. I didn’t do that. 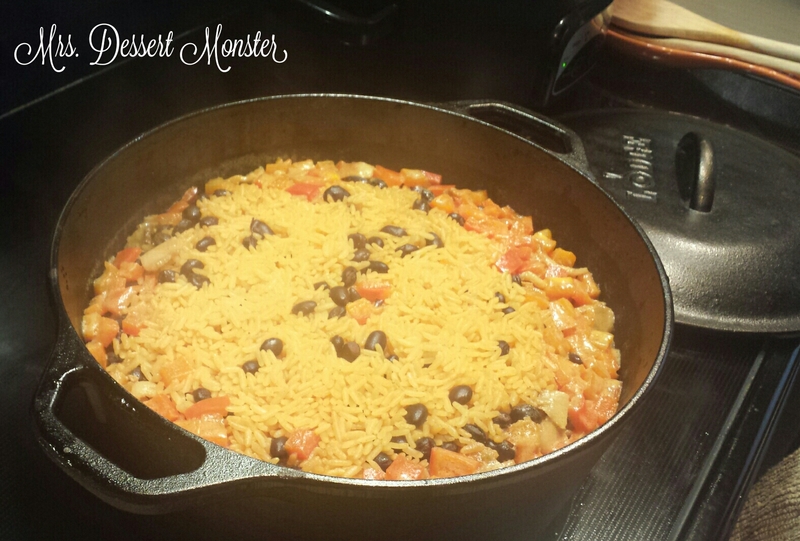 I used canned black beans that I drained & rinsed because the water inside the can is always yucky to me. This is why my rice came out kind of orangey instead of grey/black. My mom gets around this by adding a little bit of browning sauce. But I believe Congri should be judged not by the color of the rice, but by the content of the flavor. Bring it to a boil, then to a simmer. 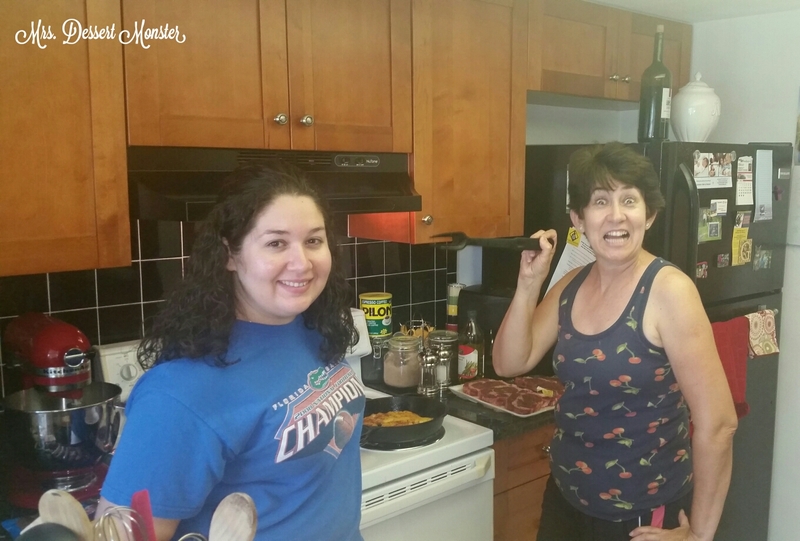 The highs & lows of cooking. Cover & let simmer for 20 minutes. After 20 minutes, stir it up. Simmer for 10 more minutes, & voila! Even for someone who’s not a rice lover (me), this is delicious. 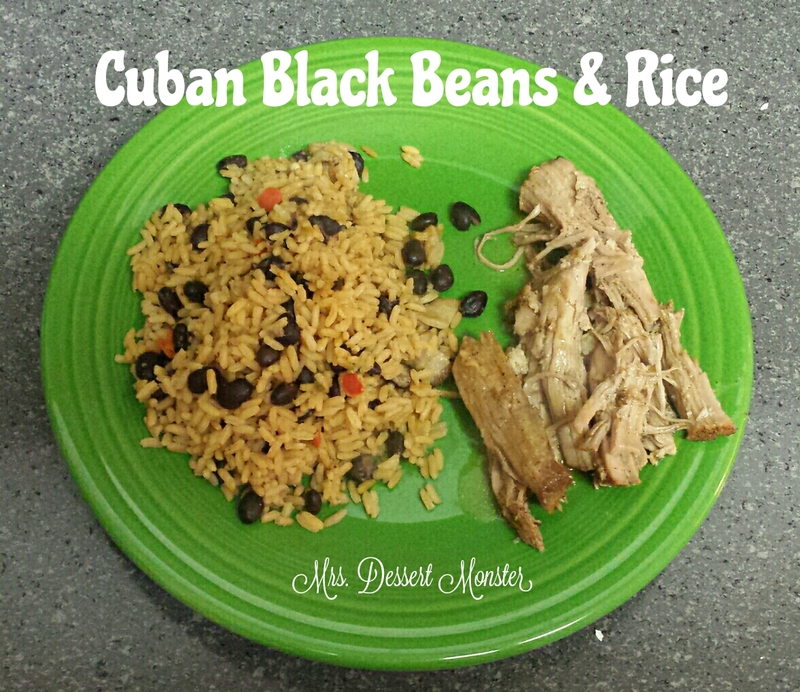 I served it with some pork roast I threw in the crock pot with mojo, fresh garlic, & cumin (I don’t think it’s a coincidence that cumin & Cuban rhyme). Sauté the uncooked rice in oil with the Sazón for a few minutes. Add the rest of the ingredients & bring to a boil. Once boiling, turn heat to low & cover. Simmer for 20 minutes. After 20 minutes, stir the rice until mixed evenly. Simmer for 10 more minutes.